I didn’t make it past the first round of Iron Painter (here is my entry) but that didn’t stoped me for a friendly paint along during round two. The theme for round two was “End of the world as we know it”. That was my que to bring out the zombies! 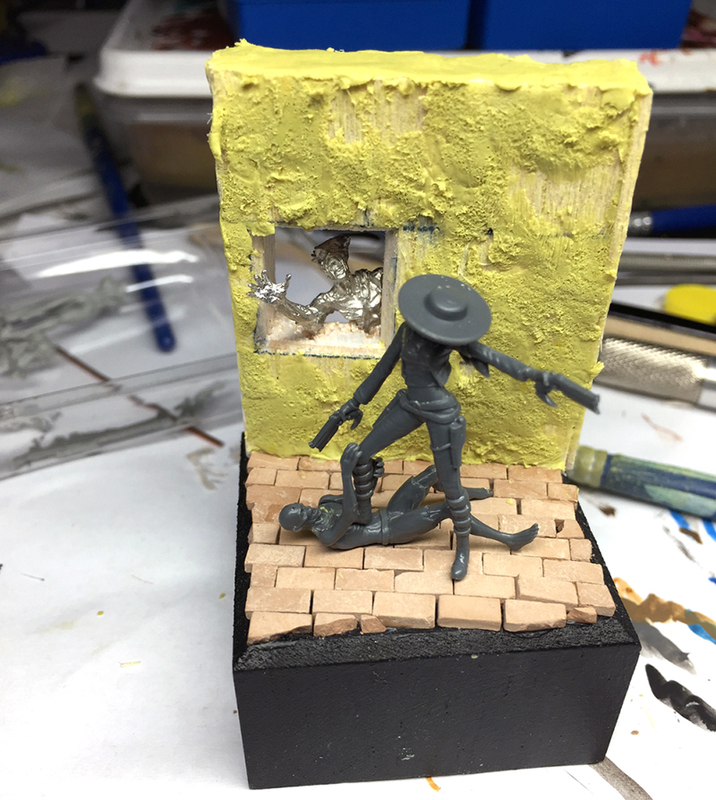 I based my miniature around Santana Ortega (a limited edition miniature from Wyrd). I also used one of the metal zombies from Nicodems avatar miniature. 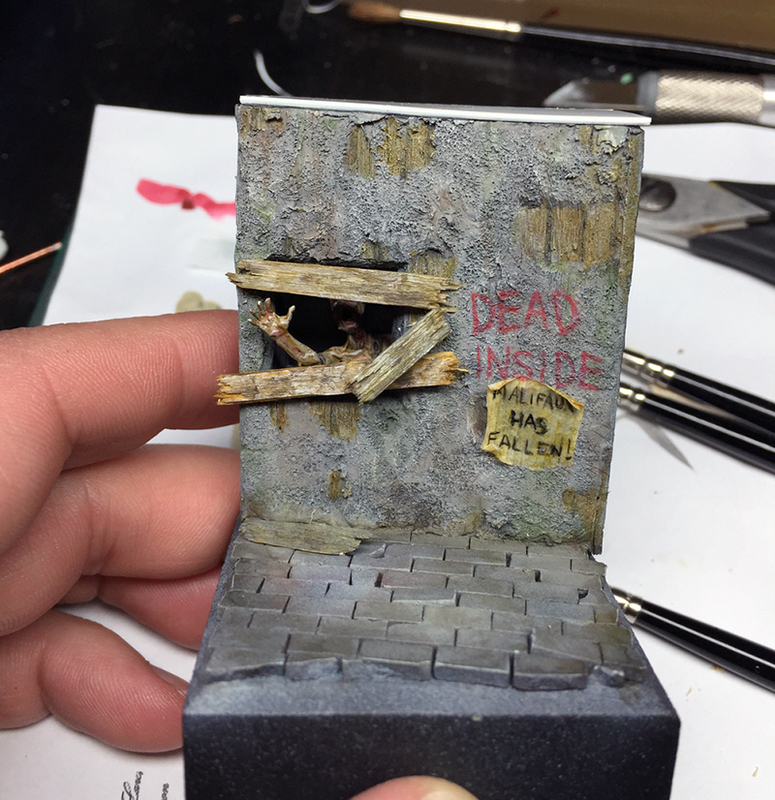 I knew that I wanted to do this with some Walking dead reference so I used a streetscene and placed a poster on the wall with the text “Malifaux has fallen”. The entire scene was done in about a week so I spent a whole lot less time on this one comparing to the last one. But it still turned out rather good. 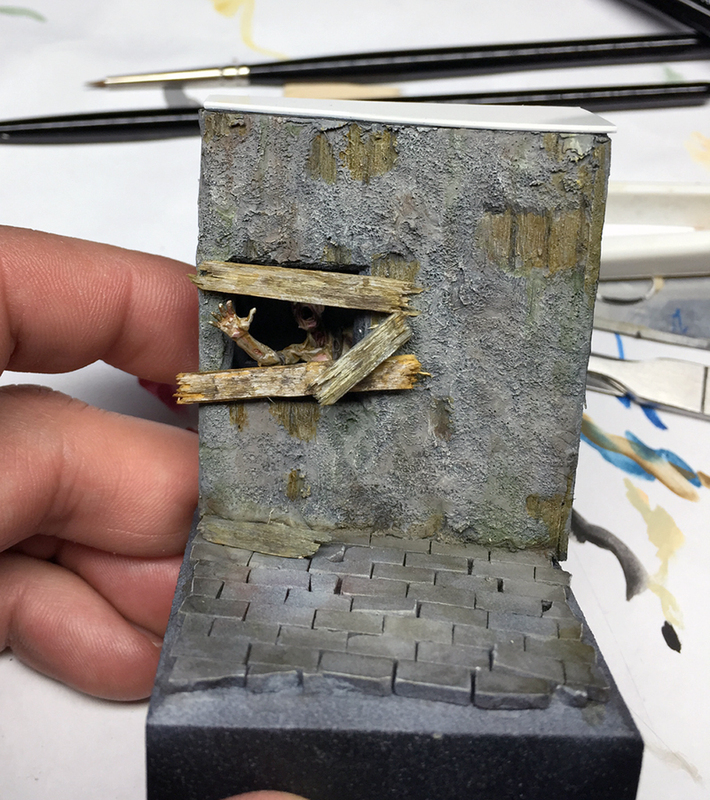 For the street I used bricks from Juweela and the wall was done with some balsa wood with I cut some structure in and then cover almost the entire wall with milliput to get a rough surface of cement or someting like that. 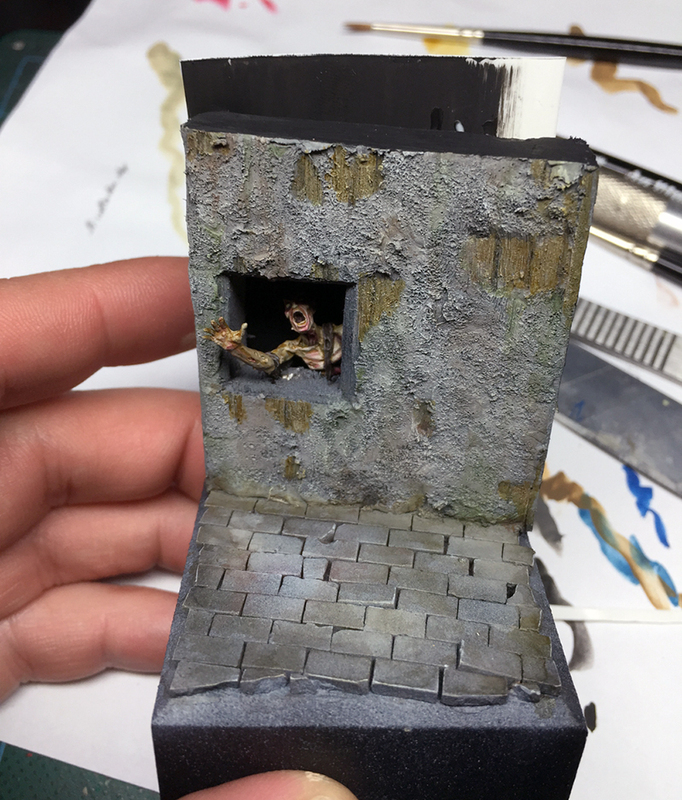 Once the miliiput had cured I primed the base with black and white primer and gave the wall and stones a a few first layers of paint using an airbrush. 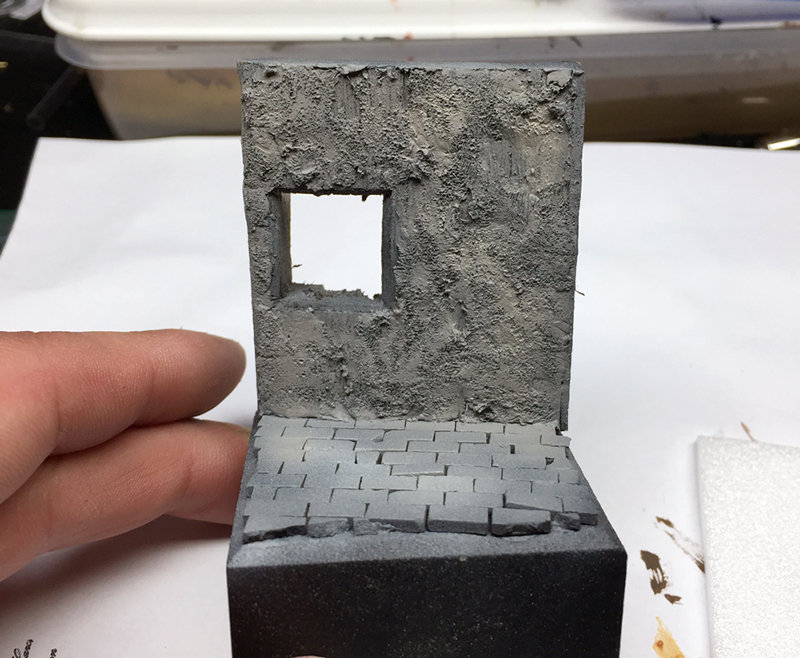 Iwanted to have a wall that was more white then grey but still not pure white so I used a grey tone mixed with a bit of Ivory for the wall and stones on the ground. But for the wall I used more Ivory then on the stones. 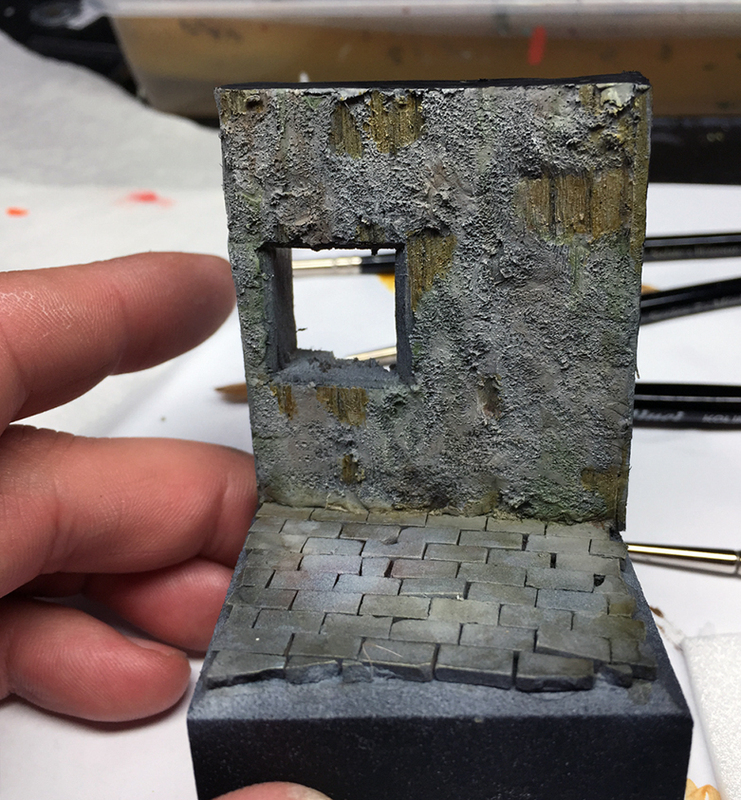 I later went over the wall and stones on the ground with some washes as well as define the structure a bit. 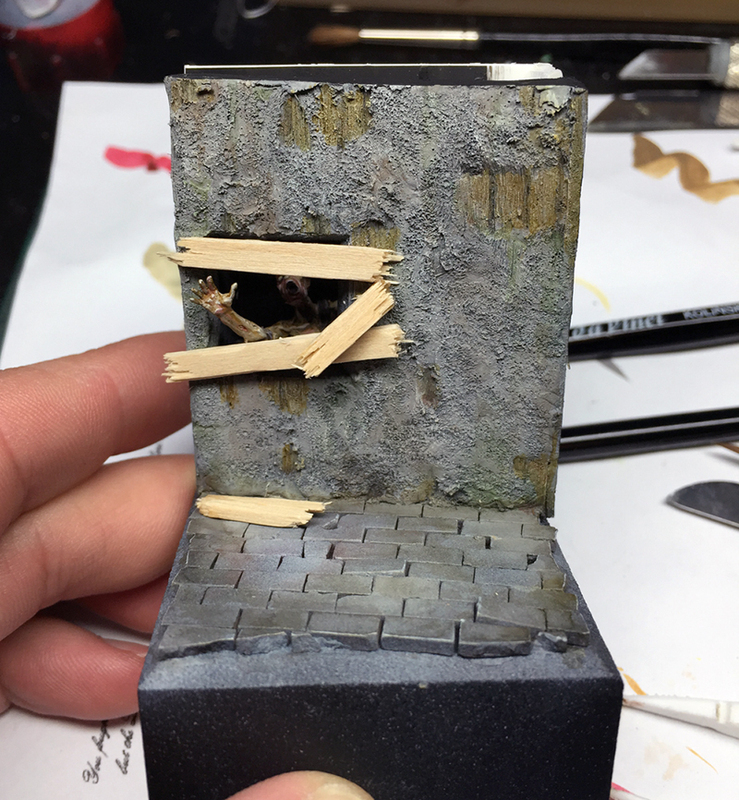 I later went over the wall and stones on the ground with some washes as well as define the structure a bit. 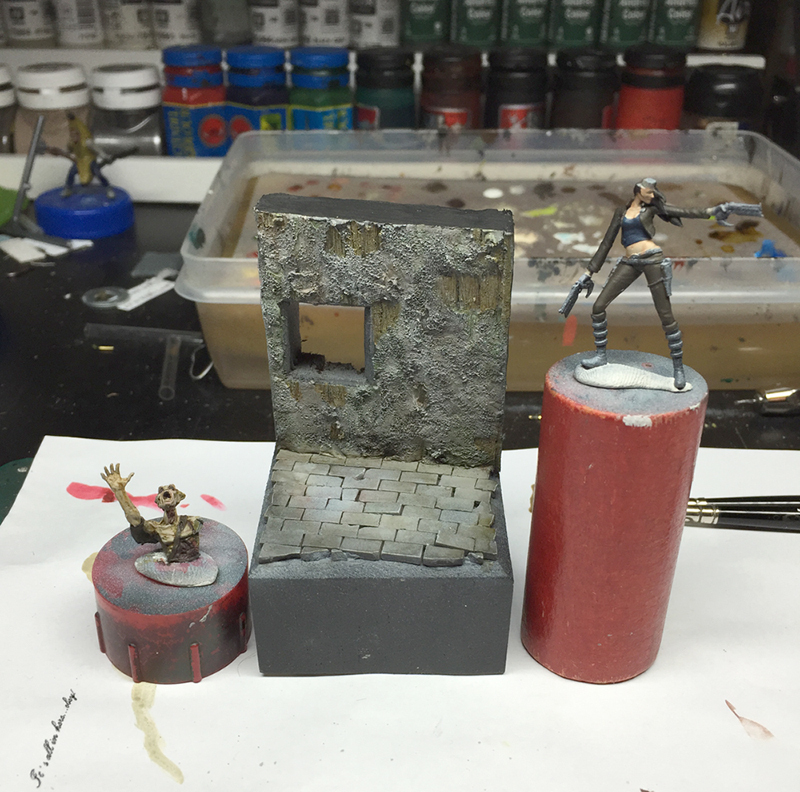 I later went over the wall and stones on the ground with some washes as well as define the structure a bit. I used a mix of a few different washes here, Inktense wood and Chestnut from Scale 75, some small amount of green and a tiny bit of black was also used. I mainly used the Inktense wood on the places where the planks was showing. And the minis so far that I had planned for the scene, the zombie that Santana will be standing on is missing in the picture. 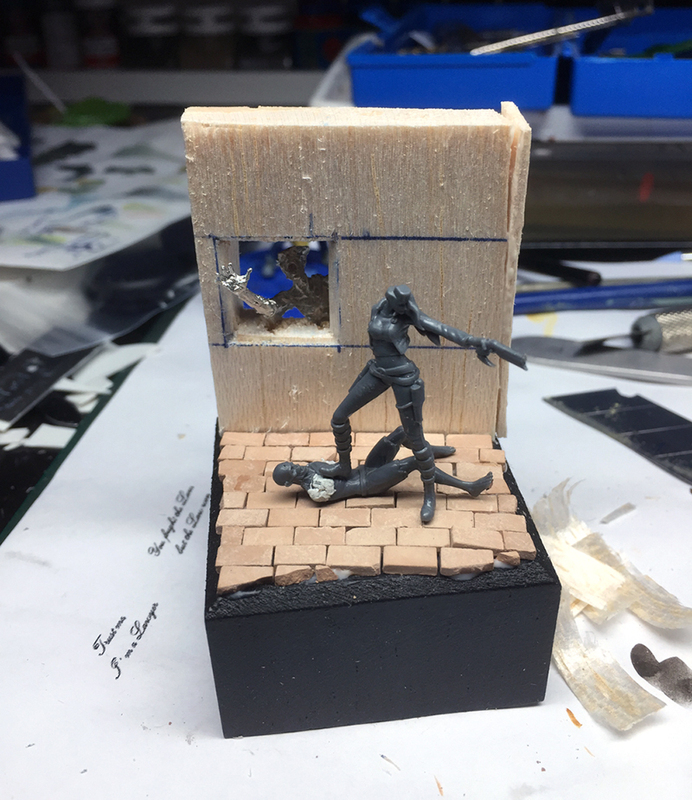 Next step was to put some paint on the zombi who would be visiable throu the window and glue him in place. My first plan was to have some bars in the window and make it look like a prison but I changed my mind and used some coffesticks to make planks instead. And with some paint on the planks looks like this. Now it was time to make the references to The Walkind dead and so I began with adding some writing on the wall as well as added a poster. The poster was put in place using matte varnish and was then given a light coat of Inktense woos before adding the writing. For the next post I will be focus a bit more on Santana as well as provide you with the finsihing pictures.